Stebbings stream viewed from the corner of Glenside Road and Stebbings Road. Our aim is to stabilise the steep banks of the lower Stebbings stream, protect the stream from sediment runoff, provide shade to the stream, enhance the area for aquatic and bird life and provide an attractive area for walkers. We remove weeds and rubbish from the Stebbings Stream Restoration area and plant native shrubs and emergent native trees in the less exposed areas. We follow a Best Practice Guide for planting to ensure a visually attractive outcome and a high success rate. 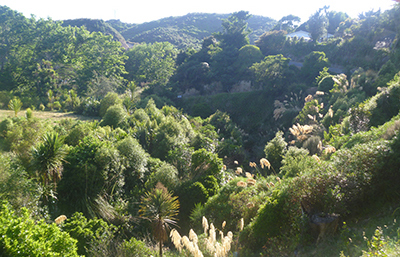 Plant native trees and shrubs received annually from Wellington City Council’s nursery and other sources such as Forest and Bird or Jay Nurseries. Care for the plants by watering, mulching, releasing, protecting (stakes, wind protectors and weed mat) and supporting with soil retainers where planting is on steep slopes. We are committed to provide this care for five years after receipt of the plants. Cut grass regularly throughout the area except in mid-summer. Remove weeds, especially blackberry, broom, gorse, convolvulus and periwinkle, and prevent the growth of wilding trees such as sycamore and wild cherry. Remove litter and buried rubbish including structures such as old fences. Open up new pockets within the restoration area for planting. Maintain predator traps in the area. Community planting sessions are held from May to September, usually on Sunday afternoons in good weather.